Growing up I never considered myself a particularly religious person. However, as I grew older my spiritual practice became even more ingrained in my daily life. That meant establishing rituals. Growing up, I never considered myself a particularly religious person. I didn’t attend services regularly, although I did study with my Grandfather and had a Bat Mitzvah. As a family, we celebrated Jewish holidays as an opportunity to be together, to feel the love we shared for one another, to remember our heritage and to honor our past. It wasn’t until my adult life that I realized the through line in my personal values were all rooted from a spiritual practice: feeling connected to others, having a loving family, building community, being present, listening, having time for reflection and contemplation, valuing past experiences as they shape the future, and honoring the sacrifices ancestors made before me. My spiritual practice became even more ingrained in my daily life when I got married. Once I was committed to building a future with a partner, it seemed important that we reflect together, that we pause together, and that we build community together. That meant establishing rituals. Some of our spiritual rituals include Friday night Shabbat. On Friday evenings, at the end of a stressful work week, we put it all behind us and light the candles, bless the wine and the bread, and often host friends for dinner. Together we shed the tension of the work week, discuss current issues in the world, and cultivate hope and community through Shabbat dinner together. If we’re not hosting friends, we will even make it to a Shabbat service. Another daily ritual in our house is a fully unplugged dinner, where we each share three highlights of our day and something we are grateful for. This encourages us to not dwell on the stressful details of our days and building our businesses. Instead, we highlight overarching moments of pride or happiness that we’re holding on to that evening. Even on days when everything seemed to go wrong, the practice of finding something to be grateful for keeps us grounded in what matters. Meditation is another daily practice. Although I have meditated for years, it wasn’t until recently that I made the connection between meditation and prayer. Both help with perspective and feeling connected to something bigger than ourselves. Meditating alongside my husband not only supports my own personal practice, but it also makes me feel more connected to him. It truly shows the power of pause, even in a micro sense. These daily rituals don’t involve going to synagogue or meeting with a spiritual leader. We can practice them in our home, on our terms. Now that I have a daughter and am building my own family, I’m thinking even more about how we can incorporate spiritual practices, and the values they cultivate in ways that work for us, not just on Saturdays or Sundays, not just on Christmas, Ramadan, Yom Kippur, or Diwali, but every day. It’s critical that we build our practice so that we have an expanded toolkit when we need it. That way, we’re not waiting until a moment of despair or difficulty to practice cultivating gratitude. Instead, we’re prepared for moments that challenge our core values, because we practice with ourselves and our loved ones every day. 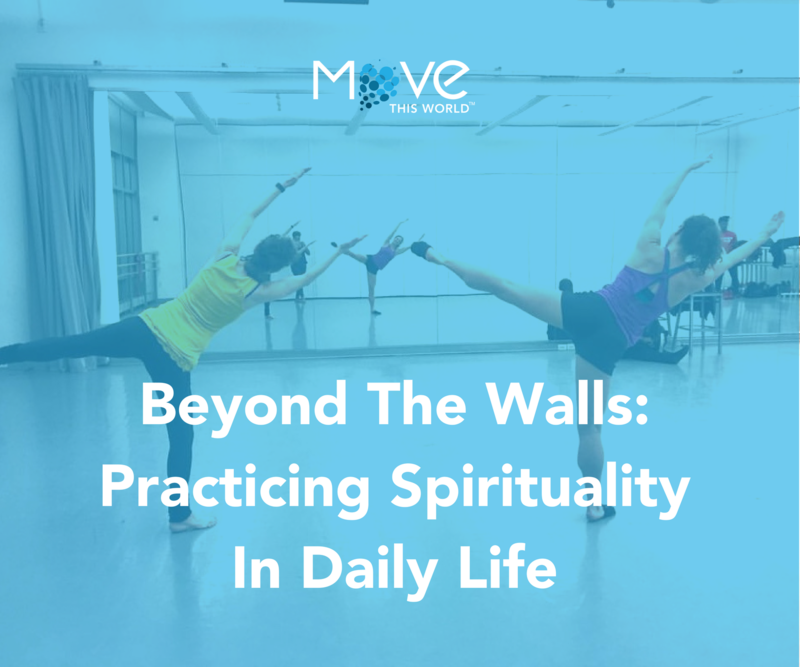 How do you practice spirituality in your daily life? Have you experienced a moment or gathering you later realized was rooted in your religious upbringing? Did it change your perspective moving forward?